PORTLAND, OR--(Marketwired - Mar 2, 2016) - Consumer Cellular, the mobile carrier with the highest overall customer satisfaction according to Nielsen Mobile Insights, today introduced the Doro 824 SmartEasy, an Android smartphone developed specifically for the senior demographic. The phone is available through the Consumer Cellular website as well as its customer call centers. "We have seen a steady shift over the past 20 years where many customers who previously preferred big button feature phones have now started upgrading to smartphones. We've been working with Doro since 2009, when we introduced our first senior-specific flip phone. It's been exciting to see the evolution of technology that now allows us to offer a smartphone specifically developed for our senior customers," says John Marick, CEO of Consumer Cellular. "While many or our existing smartphone offerings are well-suited for seniors, the Doro 824 SmartEasy takes it one step further by providing interactive opportunities for families and/or caretakers to remotely manage their loved one's device. This unique feature makes it an attractive option, not only for our senior customers, but also for their caretakers and families." The Doro 824 SmartEasy is a simple-to-use smartphone with senior-specific functionality, including a unique "coach," which guides beginners step-by-step through the device. The grip-friendly design protects the screen when placed face-down, and the charging cradle transforms the phone into a clock, making it perfect for bedside use. For added security, the phone includes an assistance button -- a one-push button on the outside rear of the device that immediately calls a saved phone number in the event of an emergency. The My Doro Manager application allows remote access to the Doro 824 SmartEasy from a helper, such as a caretaker or relative. Using My Doro Manager on a smartphone or device running the application, even iOS devices, the helper can connect to the Doro 824 SmartEasy and remotely assist with many features, including adjusting phone settings, adding or deleting contacts, managing the assistance button settings, sharing photos and offering app suggestions. The Doro 824 SmartEasy supports the Android 5.1 operating system and has a bright 5" 1280 x 720-pixel display, an 8MP camera with 4x digital zoom, 1080p HD video capture and playback, front-facing camera for video chat, a 1.2GHz quad-core processor, 4G LTE, 8GB internal memory, supports up to a 32GB microSD card, has a battery life of up to 14 hours of talk time and weighs 5.54 ounces. The device measures 5.74" (H) x 2.85" (W) x 0.40" (D). Additional features include Bluetooth, MP3, hearing-aid compatibility and Wi-Fi capabilities. The Doro 824 SmartEasy is available for $200. For a full list of features please visit ConsumerCellular.com/Doro824. For more information, please visit Consumer Cellular or call (888) 345-5509. Consumer Cellular is a top-rated wireless carrier that provides no-contract cellphones and service plans primarily to those 50+. The company has been an AARP provider since 2008 and offers AARP members special discounts on service. Founded 20 years ago on the belief that everyone should have affordable access to the safety and convenience of cellular service, Consumer Cellular is privately held with more than 1,200 employees. The Portland, Ore.-based company utilizes the nation's largest voice and data networks, which covers more than 300 million people -- or 99 percent of the U.S. population. Consumer Cellular's wireless phones and plans are sold nationwide at leading retailers such as Target and Sears as well as direct to consumers at ConsumerCellular.com or (888) 345-5509. The company has been ranked on the Inc. 5000 list for seven years in a row and has the highest overall customer satisfaction of all mobile carriers, based on Nielsen Mobile Insights survey data during Q1, Q2, Q3 and Q4, 2015. For cellphone tutorials, features, applications and company news, connect with Consumer Cellular on Facebook, Twitter, YouTube and Google+. 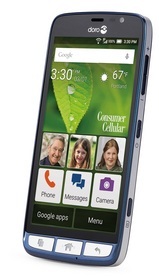 The Doro 824 SmartEasy is a simple-to-use smartphone with senior-specific functionality, including a unique "coach," which guides beginners step-by-step through the device.